The calcium in Solaray Calcium Citrate with Vitamin D3 is bonded with natural citric acid and is specially formulated for people with low stomach acid. Solaray Calcium Citrate is infused with Vitamin D for enhanced absorption. Solaray takes pride in offering great new products ... see here what we are delivering fresh to health food stores! 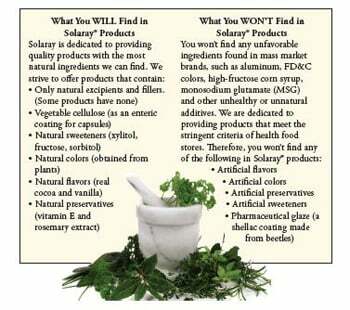 No other brand offers a wider selection of vitamins, minerals, herbs and specialty products than Solaray. With over 900 products, Solaray is the most comprehensive supplement brand in the industry! Solaray has their own manufacturing facility to ensure that quality controls are applied at every level. Solaray knows what goes into their products so you can be confident of what goes into your body. Year after year, the Solaray brand is presented with the #1 Full Line Supplement Award by Whole Foods Magazine. Solaray is not just saying they're the best; discerning health food retailers and their educated customers are voting on Solaray's excellence. Solaray began in 1973 as a pioneer in formulating and marketing blended herbal products with complementary effects. From its inception, Solaray focused on encapsulated products, which offer rapid disintegration and are easy to swallow. By 1984, Solaray became a full line manufacturer, carrying not only the highest quality herbs, but also a full line of vitamins, minerals and specialty products. Over the years, Solaray has contributed significantly to the industry through the innovation of products such as CranActin™, PhytoEstrogen™, Cool Cayenne™, PSA Control™, Estro-3™, and much more. Today, Solaray™ products are sold in over 60 countries! Making a healthier world isn't something Solaray aspires to do ... it's something Solaray is doing. This is Solaray's passion for over 35 years. Every Solaray™ product is subjected to rigorous testing and screening protocols. The process may vary by ingredient, but typically includes organoleptic (taste, touch, smell) testing to compare it to previous batches, and lab assays for microbial, identity, purity and potency validation. Only when an ingredient has passed all of the required assays is it released to manufacturing. Solaray adheres to all current good manufacturing practices (cGMP) and an independent auditing firm audits Solaray's facilities, laboratory and manufacturing protocols for compliance with the latest regulations. The Green Screened logo represents their commitment at Solaray to providing herbs of the utmost quality. The Solaray brand employs quality control standards in all areas of product development - from ensuring identification and authenticity by laboratory analysis to screening for microbes, herbicides and pesticides to heavy metal testing. Solaray rejects herbs they suspect are irradiated. Only after Solaray's laboratory analysis program confirms that the herbs meet Solaray's strict standards do they give the product their Green Screened approval. Kal calcium citrate d-3 1000 is a high potency formula, designed for superior absorption.